Take your chocolate chip cookies to a whole other level with these brown butter chocolate chip cookies! If you are looking for a rich, decadent cookie with an out of this world flavor, these brown butter chocolate chip cookies are for you! While the ingredients in these cookies are very similar to your standard chocolate chip cookie recipe, the magic is in the butter. This recipe uses browned butter, which gives it a rich, almost caramel flavor. If you haven’t made brown butter before, this is a great post that breaks it down. Out of all the cookies I make for family and friends, these are the cookies that everybody requests, and they are my oldest daughter’s all time favorite cookie. 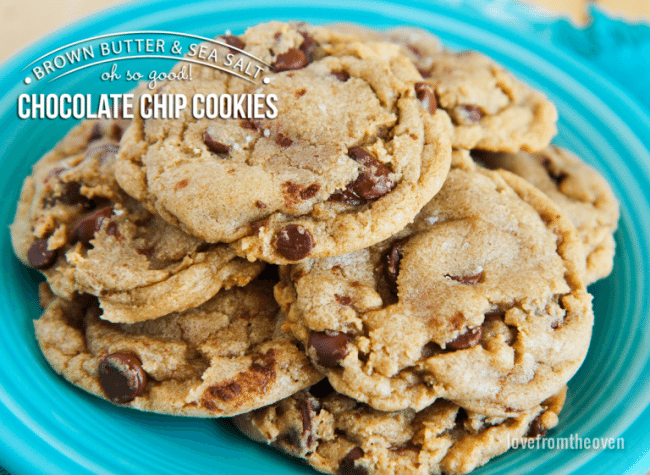 They do take some extra time, both to make the brown butter and to chill the dough, which is a must for these cookies. You need to chill the dough for at least eight hours, and you can chill the dough for up to 48 hours. Just give the dough a bit of time at room temperature prior to baking, as it will make the cold dough easier to scoop. There are two other factors that I think make these cookies extra special. 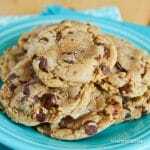 First, I use two or three different types of chocolate chips when I make them. I like to use different sizes, from mini chips to jumbo chips, and different types of chocolate, such as semi-sweet and dark chocolate. Second, after I scoop my cookie dough onto my baking sheets, I sprinkle a bit of Maldon Sea Salt Flakes over the tops of each cookie. 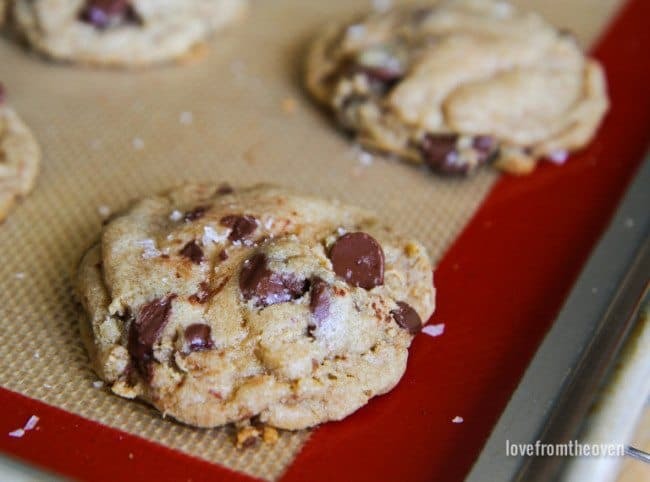 The combo of the brown butter, chocolate and sea salt is truly amazing. These delicious brown butter chocolate chip cookies are just like the bakery cookies you love, but made at home. A sprinkle of flakey sea salt is the perfect finishing touch. In a large bowl, sift together flour, baking soda and salt and set aside. In a separate bowl, mix together the melted butter, brown sugar and white sugar until very well blended, about two to three minutes. The mixture will seem a bit dry. Beat in the vanilla and eggs until mixture is light and creamy. Combine wet and dry ingredients, along with chocolate chips, chunks and grated chocolate, until well combined, but do not over mix. Cover mixture (with plastic wrap or liand chill in refrigerator for at least 12 hours and up to 48 hours. Chilling the dough is absolutely necessary when working with the melted butter, given it time to solidify and for the flavors to all come together. When ready to bake, preheat oven to 325 degrees Drop cookie dough in large (approximately 1/4 cuscoopfuls, onto a non-stick cookie sheet, or cookie sheet covered with a silicone baking mat or parchment paper, leaving at least 3" between cookies. Bake for approximately 15-18 minutes, or until edges are just lightly starting to brown. Centers will still seem somewhat underdone. Let cool on baking sheet for at least 15 minutes, as the cookies will finish baking from heat on baking sheet. Transfer to a wire rack to cool completely, then store in an airtight container. Makes approximately 18 extra large cookies or 36 standard size cookies. 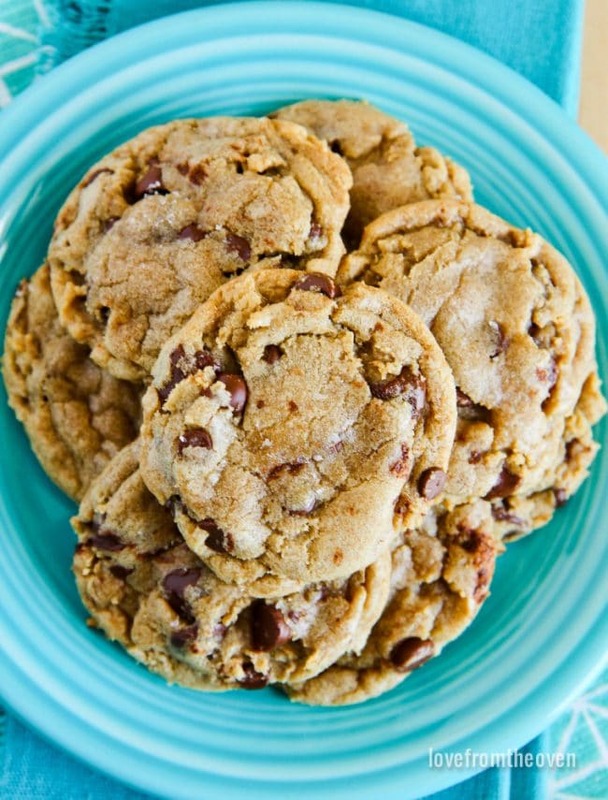 Check out all of the cookie recipes on this site! This may be a stupid question but how do you brown butter? Hi Jennifer, if you follow the link in the post, under the second photo, it’s a great tutorial on how to brown butter. For the 3/4 cup of browned butter, is it 3/4 cup of butter (1 1/2) sticks that you brown and then add, or do you need 3/4 cup of actual browned butter? Just wasn’t sure if the butter needs to be measured before or after since it reduces while browning. Thanks! I start with the 3/4 cup of brown butter and use what that yields. Hope that helps! Hi! When you bake these cookies do you use light or dark brown sugar? I’ve been using the light brown sugar. Thanks! Kayla, honestly I use the two pretty interchangeably, but for these I think the dark brown sugar will only serve to kick up that caramel flavor, and that’s always a good thing! Is the vanilla extract necessary, I don’t have any? Vanilla extract is really never a necessary ingredient, it just adds to the flavor. Hi! Thanks for sharing the recipe. I tried creaming the butter-sugar mixture with the egg until light and creamy but it didn’t lighten at all. What do you think happened? Ira, how long did you cream together the butter and sugar? Sometimes it can take a good 3-5 minutes in a stand mixer. Amazing recipe. I ran out of time and refrigerated the brown butter last night. I finished the batch today and the cookies are gone! I’m going to to start keeping a tub of browned butter on hand for other baked goods and the smell of it alone in the house is worth it.